Ambassador Stevens recalled United States –Africa’s Heads of State summit and said the three Heads of State of Sierra Leone, Liberia and Guinea held a meeting and decided that one of them should represent the MRU and they were adequately represented by President Alpha Conde of Guinea. He reiterated President Ernest Bai Koroma’s concern on the tardiness of the international community’s response and said “that is why the government of President Ernest Bai is mobilizing our people and local resources. “We contacted our friends, we have been able to get help; we have shipped a forty feet container, the embassy paid for the shipment. We will soon send another forty feet container given to the government by the Ahmmadiyya Muslim Mission, the Embassy is going to pay for the shipment. “We also took some money, and some materials and handed it over to the Ministry of Health.“Other monies we are receiving are in the bank. We set up a task force and a separate PayPal account where people are contributing. “The embassy has written letters to Airlines to help airlift aids to Sierra Leone at a reduced cost; Together with NOSLINA and SN. Brussels we have air freighted another consignment to government this weekend.” Said Ambassador Stevens. 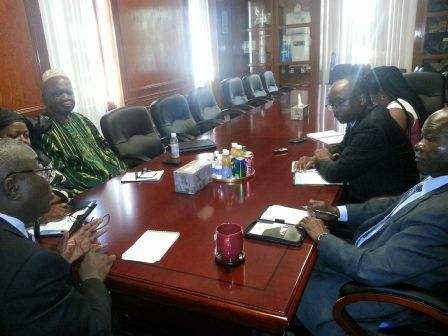 The Sierra Leone Ambassador also attended a meeting at Harvard University to discuss vaccine, medicine and assistance. “Harvard want to hear from us what the real situation is and I am glad to say that we have followed up and they need specifics from our governments by explaining our needs and justify the use. “The embassy mobilized Doctors nurses and paramedics and we held a very successful meeting. “We now have a task force, and we are meeting again on Sunday 31st August. On his part, Ambassador of Liberia accredited to the United States, His Excellency Jeremiah C. Salunteh blamed “disbelief and old cultural practice” for the spread of Ebola in Liberia. “Our people denied the existence of Ebola they thought it was a joke. “Some of the cultural practices – especially the touching of bodies, washing of corpse, dressing of Corps help makes it spread.”As I speak, the awareness is on and everyone is now aware.” Said Ambassador Salunteh. He said nearly all what the embassy of Sierra Leone is doing, is what they are also doing with the exception of few. He lauded the effort of Ambassador Bockari Stevens and promised better coordination. He said there are so many similarities in culture and tradition, that disease in one area will without many difficulties affect the others. “As from date, we will be comparing notes to identify our faintness and strengthen and our weaknesses. “Where we lack knowledge, we will learn from each other.” Said Mr. Camara. Minister /Counsellor Mrs. Isatu Sillah lauded the efforts of the MRU Ambassadors in their coordinated drive towards the eradication of the Ebola scourge. She pointed out that the three countries have a potent diaspora and with their willingness and cooperation, she has no doubt, they will impact a positive direction in the fight against the Ebola virus disease. Deputy Chief of Mission Ambassador Ibrahim .S. Conteh thanked the Ambassadors for the meeting, and expressed optimism for success of the three countries over Ebola virus disease. Why don’t these foreign journalists report accurately in Sierra Leone ?